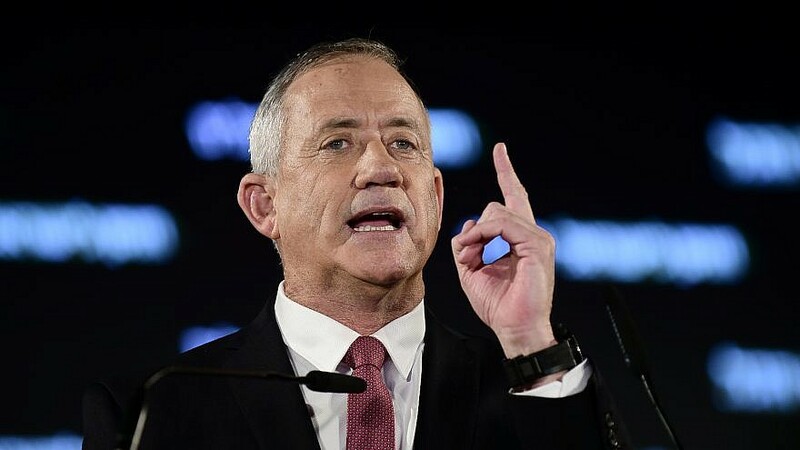 Former Israel Defense Forces' Chief of Staff Benny Gantz, head of the Blue and White Party, in Tel Aviv on Feb. 19, 2019. Credit: Tomer Neuberg/Flash90. (March 26, 2019 / Israel Hayom) After a rocket fired from the Gaza Strip early Monday morning destroyed a home in central Israel, involving seven people in one family and injuring three, Israeli Prime Minister Benjamin Netanyahu’s political rivals were quick to blame his government for failing to provide adequate security. Gantz said that Netanyahu’s policies have failed to deter the Hamas terrorist group, which rules Gaza. “A reality like this, in which Israeli is held hostage by Hamas, is unprecedented and intolerable,” Gantz said, adding that Netanyahu’s efforts to fend off a possible indictment on corruption charges had distracted him from Israel’s security. “Netanyahu should finally focus on Israel’s security rather than on his legal woes,” attacked Gantz. Homeowner Daniel Wolf described the traumatic events of Monday morning. “I happened to fall asleep in the living room, and that saved my family because I could hear the siren, and I was the only one who woke up,” he said. “I ran to my older daughter and my wife. I picked up the girls and ran to the secure room. My mom didn’t make it in. There was a ‘boom,’ then it was quiet. Later, there was a lot of dust and shouting everywhere. My mom was bleeding on the floor until the ambulance arrived. The secure room saved our lives,” continued Wolf. “We’re in total shock. Everything happened quickly. We got the girls into the secure room and forgot to close the window. My mom was between the secure room and the kitchen, and didn’t make it inside—a lot of miracles happened here, and I hope Mom will be all right. My older daughter is fine; the little one was injured behind her ear. We’re trying to cheer them up. “I saw the pictures of the house. We had dogs I loved and [that] were killed. I’m not a politician and don’t understand these things, but a solution must be found, because we can’t live like this,” he said. Knesset member Moti Yogev (Union of Right-Wing Parties) said the latest attack was a product of Netanyahu’s lack of resolve in dealing with Hamas’s constant harassment of communities in southern Israel. “Those who ignore the incendiary airborne devices, the mortars and the riots, we will see them spread all over Israel,” said Yogev. Meanwhile, Yoni Wolf, Daniel’s brother, praised him for getting his family to safety before the rocket struck.